Music enthusiasts and fans of American singer, Solana Rowe a.k.a. SZA have continued their reactions over her recent adoption of a Nigerian name " Amarachi Chinonso" on social media. SZA recently adopted a Nigerian name of Igbo origin, 'Amarachi' means 'God's grace' while Chinonso means, 'God is close' on her Instagram page.Fans immediately took to the comment section of their instagram handle to express delight, saying they were proud of the African- American artiste for "identifying with her root." Obsessed_style said, "shoutout to @SZA for being an absolute Queen. We've always love you but now our love for you is X3. Igbo kwenu! Igbogirlbrunch said, "Amarachi!!! Jodiepetite said, 11a Nigerian babe." Itslavivi said, "Can you please tells us the inspiration behind the Igbo name in your bio? Zizilords.xo said, " Chineke such beauty!!! Daluu ooh#igbo_sister. The Grammy-nominated songstress, who recently performed at the Dreamville festival -- a concert which also featured Davido, a Nigerian Afrobeat singer -- would now want to be addressed by the name, which is of Igbo origin. The 29-year-old Grammy-nominated artiste singer born to African American parents, a Christian mother and a Muslim father in St. Louis, recently performed at the Dreamville festival -- a concert which also featured Davido, a Nigerian Afrobeat singer. The artist is set to be on the official soundtrack for Game of Thrones, Season eight, alongside "The Weekend" and "Travis Scott." 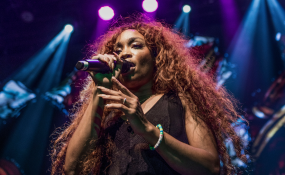 SZA's debut studio album, Ctrl, was released in 2017, It debuted at number three on the US Billboard 200 and was eventually certified platinum by the Recording Industry Association of America (RIAA). Her lyrics are described as "unravelling" and her songs often revolve around themes of sexuality, nostalgia, and abandonment.